This name uses Spanish naming customs: the first or paternal family name is Ruiz and the second or maternal family name is Cortines. He was the first Governor of Veracruz to serve a 6-year long term. Adolfo Tomás Ruiz Cortines (Spanish pronunciation: [aˈðolfo ˈrwis koɾˈtines]; December 30, 1889 – December 3, 1973) was a Mexican politician who served as 47th President of Mexico from 1952 to 1958, as the candidate for the Institutional Revolutionary Party (PRI). Unlike his predecessor as president Miguel Alemán and his successor Adolfo López Mateos, he had participated in the Mexican Revolution. He was one of the oldest presidents of Mexico, perhaps best remembered for granting women the right to vote in presidential elections and stimulating the Mexican economy during the period known as the Mexican Miracle. 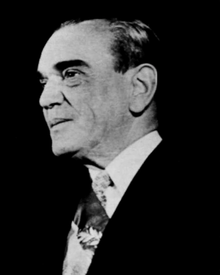 Adolfo Ruiz Cortines was born on December 30, 1889, in the state of Veracruz. His parents were Adolfo Ruiz Tejada (1859–1890), the governor of Veracruz at that time, and María Cortines Cotera (1859–1932). Ruiz's father, Adolfo Ruiz Tejada, died when he was young. Then Adolfo was raised and educated by his mother. His mother taught him to read and write at the age of 3. Later, he entered a school directed by Joaquín Jerónimo Díaz and Florencio Veyro. At the age twelve, he attended the Instituto de Veracruz, where he studied accounting. Adolfo Ruiz Cortines pursued his secondary educational studies at the Colegio de los Jesuitas, which was considered the best school in the state of Veracruz. Adolfo learned from his mentors about liberalism, a political principle he would apply during his entire political career. In addition, he acquired his fanatical interest in baseball there. He always wanted to study at university, but circumstances never permitted him to do so. At the age of 16, he was forced to abandon his formal studies. Finding himself the head of his family, he found a job as an accounting assistant at a commercial clothing enterprise to support his relatives. In 1909, Ruiz read the book La sucesión presidencial de 1910 (The Presidential Succession of 1910) published that year by Francisco I. Madero, the leader of the opposition against the presidency of General Díaz. This book motivated Ruiz's interest in politics. In 1910, the Mexican Revolution started and he became influenced by several of its main players such as Pascual Orozco and Francisco Villa. Because of this influence, in 1912 at the age of 23, he moved to Mexico City. During his stay in Mexico City, President Francisco I. Madero was assassinated and General Victoriano Huerta took power. Since Ruiz Cortines was opposed to the Huerta government, considered by a broad group of Mexicans as a usurper, he joined revolutionary forces under the command of Alfredo Robles, a right hand of the revolutionary leader of the Constitutionalist faction, Venustiano Carranza. Robles was in charge of the revolutionary forces in the south and center of Mexico. Ruiz Cortines did see military action in battle, but his main task was as an army paymaster. In 1920, when Carranza was attempting to flee Mexico after the revolt of Sonoran generals Adolfo de la Huerta, Alvaro Obregón, and Plutarco Elías Calles who objected to Carranza's attempt to impose his successor, Carranza took a huge amount of the treasury's gold. His train was captured and the gold was returned to Mexico City, with the young and trusted Ruiz Cortines receiving it. With his background in accounting, a reputation for honesty, and credentials as a revolutionary, there were options open to him in the 1920s. He served in the government's Department of National Statistics; he took classes in statistics from Daniel Cosío Villegas, then a young teacher and later an important historian of Mexico. Ruiz Cortines argued in publications that the Department of National Statistics should be an autonomous agency. In 1935 during the presidency of Lázaro Cárdenas, Ruiz Cortines's political career began at age 45, as the director in charge of Mexico City. It was during that time that he met Miguel Alemán Valdés, son of a revolutionary soldier, now a young lawyer who would later become president of Mexico (1946-1952). In 1940, Ruiz Cortines managed the presidential campaign of Cárdenas's choice as successor, Manuel Avila Camacho. Five years later, the president Ávila Camacho designated Alemán as Minister of the Interior (Secretario de Gobernación), a powerful position. Miguel Alemán asked Ruiz to join him as his sub-secretary because of their personal friendship. This position gave Ruiz the opportunity to gain influence within the Institutional Revolutionary Party. After several years, the PRI designated him as candidate for governor of Veracruz. In December 1944, Adolfo Ruiz Cortines became governor of Veracruz. During his administration, he expanded public education in the state. Some of the institutions he founded were the Technical Studies Institute (Departamento para Estudios Técnicos) which provided people with a practical education that allowed them to improve their quality of life. Furthermore, he founded the Institute of Anthropology and the State Planning Committee, among others. He also modified the local Constitution to allow women to participate in the local and municipal elections. He built roads and bridges to develop Veracruz's infrastructure since it was one of the main ports of Mexico at that time. On October 14, 1951, Ruiz Cortines was named candidate for the presidency by the Institutional Revolutionary Party (PRI) by the incumbent president, as was the practice. The PRI was the dominant party and Ruiz Cortines's electoral victory was entirely expected. On December 1, 1952, he assumed the presidency of the republic. After the corruption scandals of the Alemán years, he wanted to give a new image to the government and re-establish its credibility. His credo was “austerity and moralization”. He exercised tight control of public expenditure, supported the construction of roads, railways, dams, schools and hospitals. He also implemented a plan called "March to the Sea", which had the aim of shifting population from the highlands to the coast, and making better use and development of marine and coastal resources. Under this program, malaria was eradicated. He created the Rural Social Welfare Program to improve the living conditions of the rural population and encouraged land distribution. Large foreign estates were expropriated. Furthermore, he implemented the Farm Security program to protect farmers from natural disasters. At the beginning of his term, President Ruiz Cortines sent a bill to amend Article 34 of the Constitution, in order to grant women equal political rights with men; this granted the vote to Mexican women. In order to promote measures to meet the need for homes, he created the National Housing Institute. He gave a stimulus to industry, particularly small- and medium-sized, and laid the foundation for the development of the petrochemical industry and promoted the creation of jobs. In response to the technical advances in the field of nuclear energy, and considering that Mexico could not remain unaffected by this development, he created the National Nuclear Energy Commission. Primary and secondary education were boosted greatly. He specially supported the polytechnic university. Ruiz equipped the facilities of the National Autonomous University of Mexico (UNAM) and began subsidies to support universities through the republic. Another primary goal of his government was to improve the health of men and women in Mexico. Therefore, he fought malnutrition among children and promoted an immunization campaign. Ruiz Cortines turned his attention to social problems and imposed an era of austerity on the Mexican government. He modified the law in order to promote responsibility and honesty among public servants since there was a lot of corruption. Ruiz Cortines created a law that forced public servants to declare their assets before beginning to work in the government. Ruiz's purpose was to compare the public servants fortune before and after their participation in public charges, in order to combat illicit enrichment and corruption. Ruiz's government decided to reduce public spending, to consolidate public finances and fight inflation. This policy allowed Mexico's economy to grow at an enormous rate since for the first time in many years the Mexican government generated a budget surplus. Unfortunately in 1953, private investment went down and Ruiz Cortines lost popularity. He reoriented his policy towards boosting production. In April 1954, in the so-called ‘crisis de la Semana Santa’, he had to devaluate the peso from $8.65 per dollar to $12.50 per dollar. By the end of his term in 1958, he faced three social-political conflicts with peasants, teachers and the labor union of the railroad workers. During Ruiz's term, Mexico had cold diplomatic relationships with the United States of America, because Ruiz refused to make any agreements that committed Mexico to participate in international wars. During his term, Ruiz completed the construction of projects like Falcon dam, built with a 58.6% equity and 41.4% Mexican American[clarification needed] funds. In 1956, Ruiz attended a meeting with President Dwight Eisenhower and Prime Minister Louis St. Laurent of Canada. During the meeting, the leaders discussed immigration issues, economic cooperation, civil aviation and illegal fishing in coastal areas. In general, President Ruiz's foreign policy was conservative and respectful of the sovereignty of other nations. His administration was looking for a closer relationship with Latin America and sought the integration into the institutional system of Latin America, the Organization of American States (OAS). In the Conference of Caracas, held in 1954, Mexico failed in its attempt to defend the self-determination of the people. On December 1, 1958, Ruiz handed over power to his successor, Adolfo López Mateos and then he retired from public life altogether. In his last days, his friend Manuel Caldelas García, a politician whom he had known in his youth, began living with him at his home in Veracruz. Caldelas helped with household chores and took care of the former president. On the afternoon of December 3, 1973, the health status of Ruiz Cortines became critical. Dr. Mario Díaz Tejeda went to the home to treat the condition of the former president. When the drugs took effect on him, Ruiz Cortines fell asleep. At 9:05 am on Monday, December 3, 1973, Tomás Adolfo Ruiz Cortines died at 82 years of age, a victim of heart failure caused by arteriosclerosis. ^ a b c d Fernández, Íñigo (2008). México Contemporáneo I [Contemporary history of Mexico] (in Spanish). 1. México, MX: In Pearson Educación. pp. 322–394 . ^ Enrique Krauze, Mexico: Biography of Power. New York: HarperCollins 1997, pp. 605-606. ^ Krauze, Mexico: Biography of Power, p. 606. ^ Krauze, Mexico: Biography of Power, pp. 606-607. ^ a b c d e f g Krauze, Enrique (1999). El sexenio de Ruiz Cortines [Ruiz Cortines Term] (in Spanish). México, MX: Clio. pp. 90, 100, 178. ^ a b c Delgado de Cantú, Gloria M. (2003). Historia de México II. Pearson Educación. p. 286. ^ Delgado de Cantú, Gloria M. (2003). Historia de México II. Pearson Educación. p. 299. ^ Delgado de Cantú, Gloria M. (2003). Historia de México II. Pearson Educación. pp. 290–292. ^ a b Bermúdez, Gilberto (2006). "Adolfo Ruiz Cortines" [Adolfo Ruiz Cortines] (in Spanish). México: Gobierno del Estado de Veracruz. Archived from the original on 2009-03-26. Retrieved 2010-10-22. ^ Delgado de Cantú, Gloria M. (2003). Historia de México II. Pearson Educación. p. 293. ^ Delgado de Cantú, Gloria M. (2003). Historia de México II. Pearson Educación. p. 295. Camp,Roderic A. Mexican Political Biographies. Tucson, Arizona: University of Arizona, 1982. Luna Elizarrarás, Sara Minerva. “ENRIQUECIMIENTO Y LEGITIMIDAD PRESIDENCIAL: DISCUSIÓN SOBRE IDENTIDADES MASCULINAS DURANTE LA CAMPAÑA MORALIZADORA DE ADOLFO RUIZ CORTINES.” Historia Mexicana, vol. 63, no. 3 (251), 2014, pp. 1377–1420. JSTOR, www.jstor.org/stable/24369004. Pellicer De Brody, Olga Pellicer and José Luis Reyna. “LAS MODALIDADES RUIZCORTINISTAS PARA MANTENER LA ESTABILIDAD POLITICA.” Historia De La Revolución Mexicana, Período 1952-1960: El Afianzamiento De La Estabilidad Política, and JOSE LUIS REYNA, 1st ed., vol. 22, Colegio De Mexico, México, D. F., 1978, pp. 13–72. JSTOR, www.jstor.org/stable/j.ctv233pb3.5. Wikimedia Commons has media related to Adolfo Ruiz Cortines.